Of those writers who stoically refuse to trudge along horror fiction's well-worn path, Joyce, with British Fantasy Awards to his credit for Requiem and The Tooth Fairy, has perhaps had the most success. 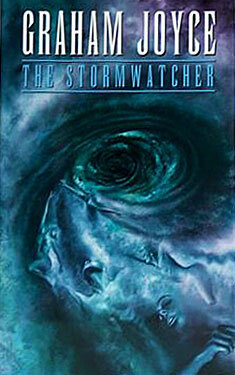 And now we can add to that list The Stormwatcher... For this remarkable, fine and almost unclassifiable book is a complete breath of fresh air, even considering his past achievements. The story is simply (!) the interaction of a group of somewhat dysfunctional friends during a two-week holiday in a lonely cottage in the Dordogne region of France. The group comprises James and his French wife, Sabine, and their two young daughters - Beth and the confused Jessie -plus James's one-time colleague Matt and his wife, Chrissie ... and, just to make things interesting, the sultry Rachel, another work-chum of James and one with whom he has shared considerably more than the occasional business meeting. As the story progresses we discover that one of the party - an unnamed instructor whose identity is kept hidden until the end of the book - is engaged in secret lessons with the impressionable Jessie, for reasons not immediately clear. Meanwhile, courtesy of a nicely-realized series of tense-changed flashbacks, we learn more of the instructor's background and an almost symbiotic relationship in which both she and her lover speak only lies to each other. All the time, Jessie grows more intense and confused while, around her, other members of the party grow, by turn, increasingly belligerent or subservient, manipulative or malleable, paranoid or confident. And underpinning the sequence of events is an intense feeling of primal sensuality evoked both by the environment and an approaching storm (its progress cleverly interjected into the proceedings by a series of half-page chapters explaining meteorological behaviour) and by the behaviour of the adults as their feelings for each other - and their protectiveness and confusion at the antics of and comments from young Jessie - swirl and eddy.